Festive food shopping is easy with this box of organic trimmings. Inside, you’ll find 20 pigs in blankets, a tray of our own pork, chestnut and apricot stuffing, tangy handmade cranberry sauce and 184g of unsmoked streaky bacon. All the best bits to fight over! Find Christmas meat to serve alongside in our online butchers shop. 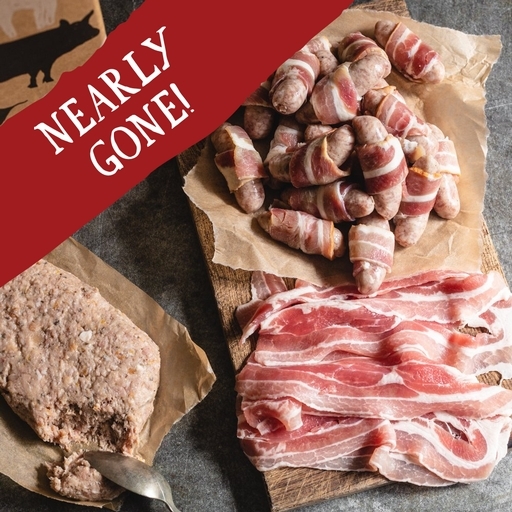 Pigs in blankets and stuffing are previously frozen – not suitable for home freezing. The organic pork in our sausages, bacon and stuffing comes from Helen Browning at Eastbrook Farm in Wiltshire. Helen set up her farm over 27 years ago. She’s a champion of organic farming and giving animals the best quality of life – in fact, she’s Chief Executive of the Soil Association and spends much of her time campaigning for better animal welfare. Unsmoked streaky bacon: Pork, salt*, cane sugar, sodium nitrite*, potassium nitrate*.